Born with bilateral club feet, I knew life would literally be an uphill climb. My feet were bent backwards so my toes were almost on my heels. I was in casts for the first nine months of my life until my feet grew big enough to operate on. I underwent multiple pediatric orthopedic surgeries to realign the bones in my feet and then wore more casts as I healed. Also, when I was in Kindergarten, I needed surgical Achilles tendon releases and was splinted and in a wheelchair for recovery. Years later while in college at UW-Whitewater I had to have surgery on both my knees because they kept dislocating. Two screws were placed in each knee to tighten the ligaments. One night while my roommates were watching football I said to myself, “This is boring”, so I went outside and tried to see if I could run to the end of the block. I was able to do it, although my knees hurt badly. 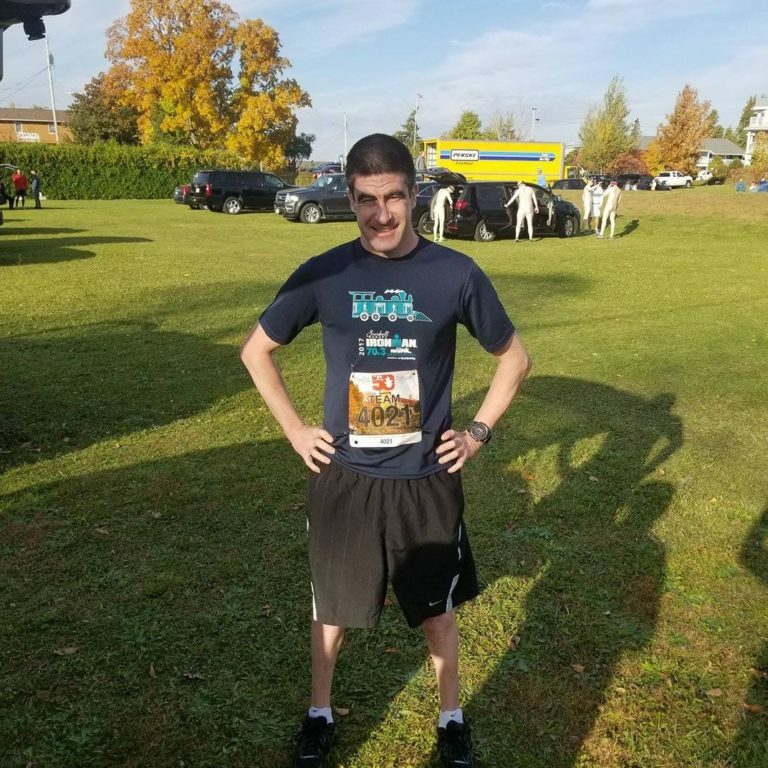 But I pushed through the pain and kept on doing it until I could run a mile, then went further and further until I could run a marathon. I’d eventually face another physical hurdle after fracturing and dislocating my left ulna bone which is in your forearm. The doctor said it was one of the worst breaks he’d ever seen and told me I wouldn’t be able to perform any more sporting activities. But I was determined to prove him wrong! A few years later I was biking on the path towards my brother’s house and was wondering what all the traffic was. My brother’s wife told me it was the Ironman and asked if I was going to do it. At the time I was only biking and running and had NO idea how to swim. The following year I went with my Dad to watch the Ironman mass swim start and looked one of the elite athletes in the eye as he was coming out of the water and right then I knew I wanted to become an Ironman, though I knew it would take a ton of training and convincing of people because of all my surgeries. After that moment I began training hard and found a triathlon store which put together a good training plan for me and a good team to train with. The following year I saved up for my first road bike (a Giant OCR 1 which I still have and use!) 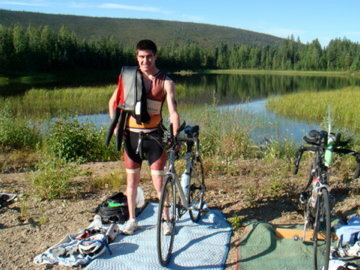 and in 2008 signed up for my first triathlon at Devils Lake! I trained all summer for it, except the swimming part. During the race, I struggled with the swim and had to go to shore and walk the rest of the way. I found my Dad and he told me to keep going, so that’s what I did. I finished the race minus the swim. The following year I took it upon myself to learn how to swim. 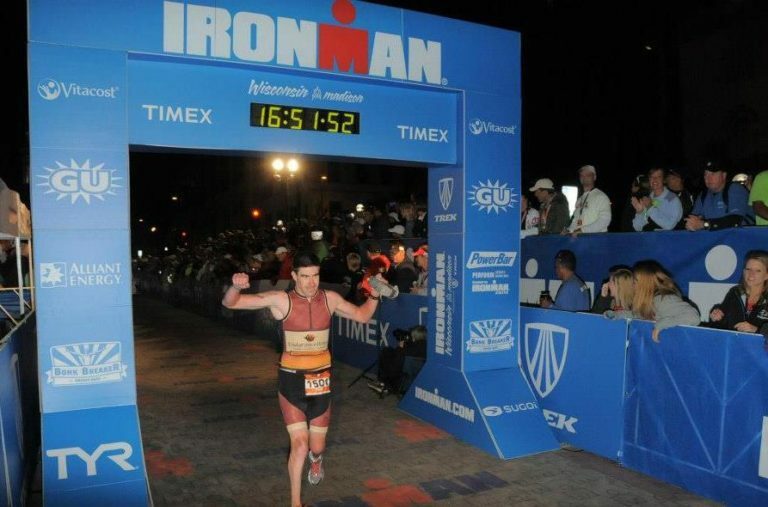 2012 was the magical year when I signed up for Ironman Wisconsin and Door County Half Iron. Back then this race sold out quickly at midnight on New Year’s, so I stayed up till midnight to sign up and got in! Door County was the first race where I felt comfortable swimming in open water. That year there were no waves and I could see the bottom — I’ll never forget it. I went on to finish Ironman Wisconsin that year with a time of 16 hours and 51 minutes! Ever since that year I’ve been hooked! The advice I would give is to Never Give Up! What motivated me to keep going is I wanted to lose weight, get in shape and prove to people I could take part in sporting activities again. No matter how long it takes keep fighting and chase your dreams even if people say you’re crazy. It took me four years to train with a team and finally get the courage to sign up for a full Ironman and I’m glad I did it!